We're kicking off our Summer guest blogger series today! We are excited to be sharing posts from several awesome kid's bloggers this summer. We hope you'll love their posts and head over and check out all the other great ideas they have to share on their Facebook pages and blogs. Our first blogger is Crystal from Growing a Jeweled Rose. Hello, my name is Crystal, and I am so excited to be guest posting on Toddler Approved today! 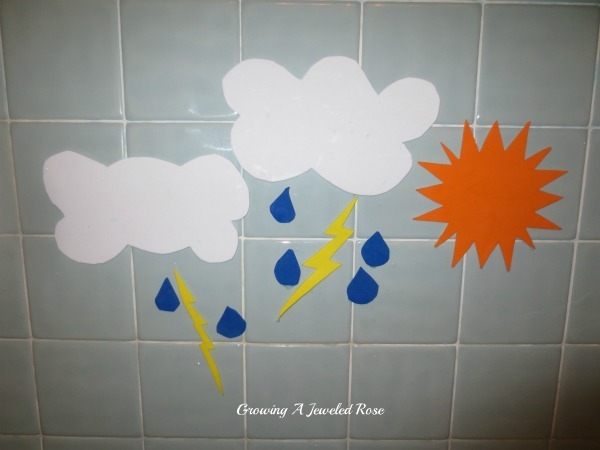 I am the writer of Growing A Jeweled Rose, a play based blog where I share play and learning activities for small children. 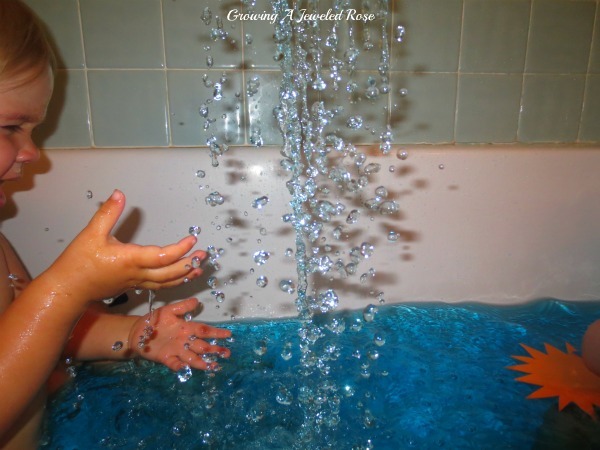 One of our favorite ways to play is at bath time, so today I am sharing one of our fun bath ideas. My older daughter Rosie has been fixated on the sky lately, always pointing upward at a helicopter, bird, or unique cloud formation floating by. 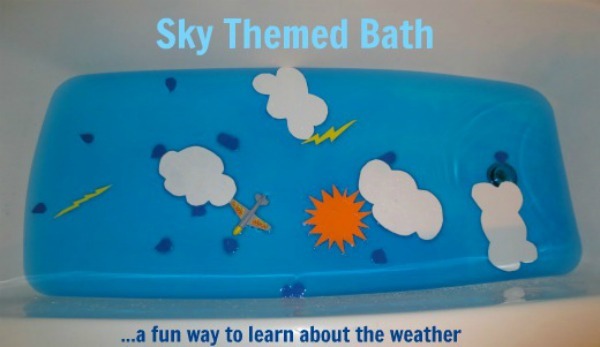 This inspired me to create a sky themed bath for her. To create this bath, I dyed the water blue using food coloring. It does not stain the bath or child, and adds such a fun element to bath time. I added a touch of rain scented bath oil to further enhance Rosie's senses, and really bring the sky them to life. I then cut various shapes out of foam craft squares. I also threw in an airplane, and a strainer so that she could make rain. This was such a fun way to focus on Rosie's interests, and further explore the sky! Rosie had a lot of fun sticking the foam shapes to the wall, and my younger daughter Jewel delighted in taking them down. We talked a lot about the weather, and how the rain comes from the clouds. Then Rosie delighted in making a little rain of her own. This was definitely Rosie and Jewel's favorite part! This fun bath activity presented great opportunities to introduce new vocabulary words. 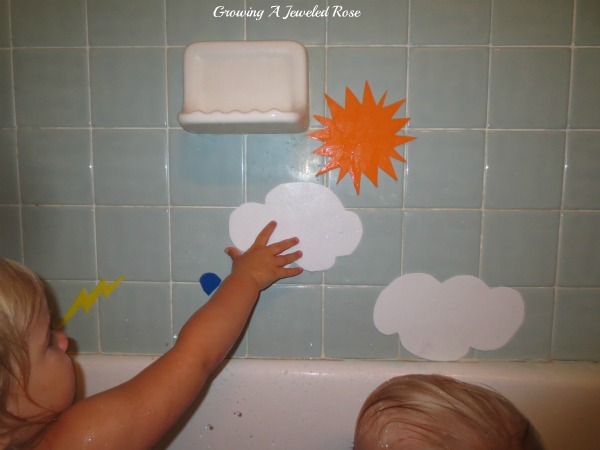 It was also a great way for a toddler to explore the varying elements of the sky. There are so many fun ways to explore and play at bath time. Some other fun baths that we have created are a Glowing Outer Space Themed Bath, a Birthday Celebration Bath and an Ocean Themed Sensory Bath. I would love for you to drop by Growing A Jeweled Rose and check out some of the other fun playtimes we have shared. We especially love sensory play, things that glow, and getting messy! Lastly, I would just like to thank Toddler Approved for the opportunity to share here today! It has been such an honor! Another great themed bath. This might be my new favorite. We love playing with foam shapes in the tub. I just might have to recreate this one for my boys. Very inspiring, as always. I love that photo of the rain coming out of the colander! 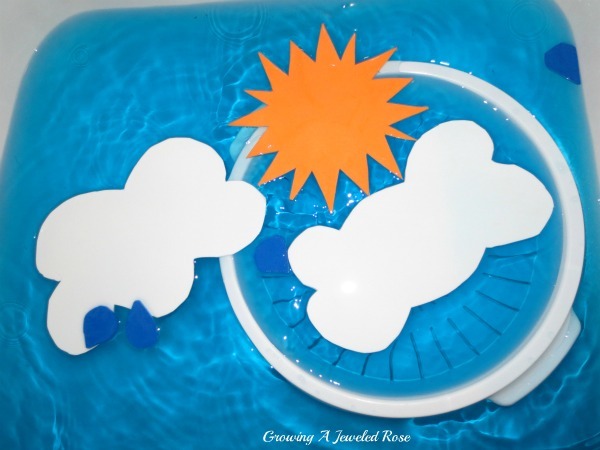 I think the foam cutouts are absolutely brilliant - I never even thought of using them in the bath and I have a lot of it stashed in my craft supplies. Thanks for sharing! This looks like so much fun! I love the rain machine! This is so cute. The blue water looks very inviting :) Colander in the bath tub is a great idea!! Have to do that.